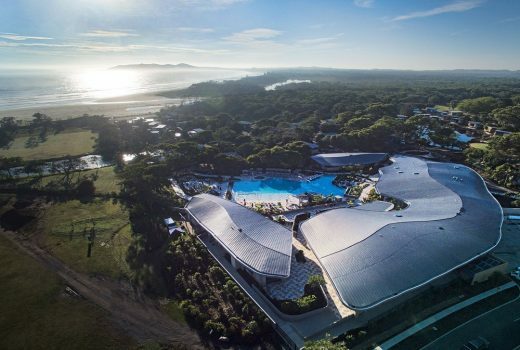 Leading Brisbane architecture firm Shane Thompson Architects has designed the new Elements of Byron resort on the beaches of Byron Bay, Australia. The project is respectful of its unique and special site set on 50 acres, with almost two kilometres of beach frontage. The design pays homage to the resort’s landscape, including the critically-endangered littoral rainforest, natural lakes, ponds and diverse wildlife. 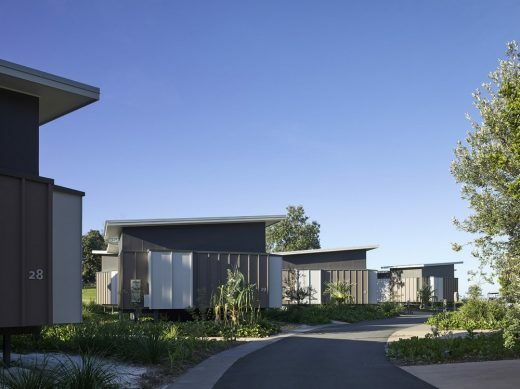 Shane Thompson Architects’ design of the central facilities and accommodation (94 villas) is inspired by local naturally-occuring forms – sand dunes, native trees, ocean and lakes. The leisure and conference facilities are housed under three separate pavilions, which represent the sand dunes bounding the resort. The signature curved shape of these central facilities is an organic form, which unifies the resort and links it to its iconic surroundings. Colour schemes, patterns, textures and finishes were drawn from traditional and rural activities, creating a powerful connection to the landscape, site, and environmental and cultural sensitivities of the area. An infinity lagoon pool weaves through the resort, alongside a communal fire pit and sun beds, encouraging water play. The resort is an exemplar of sustainable design, with a minimal 10% building footprint. 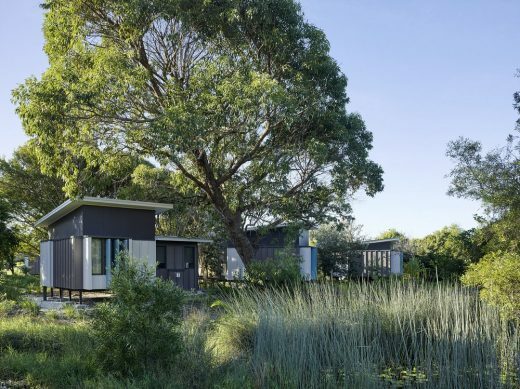 Shane Thompson Architects proposed the reestablishment of the original dunal and wallum landscape to minimise future maintenance and irrigation demands. The nature-first approach saw the introduction of over 65,000 new native trees and plants, and single-storey buildings to showcase the surroundings. Cost-effective rectilinear-plan forms were used, alongside conventional structures and finishes, to respond to site and budget constraints. Shane Thompson Architects has consciously created a sense of community and place of luxurious retreat. 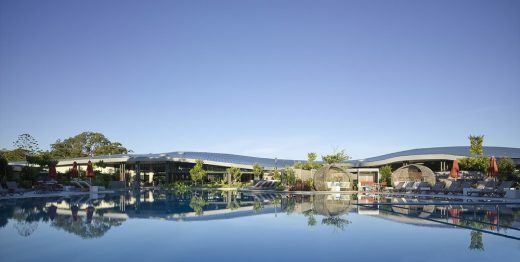 The resort projects an iconic and distinctly-Australian character to travellers and the wider Byron Bay community.